Move aside “Monopoly,” “Risk,” and “Snail Race!” Time to teach the youth of the world of an important, career-advancing game: how to leverage data and analytics to change your life! 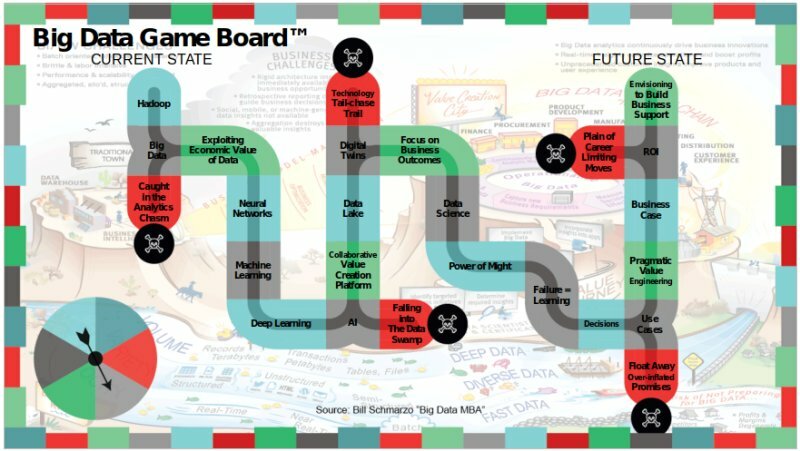 Introducing the “Big Data Game Board™”! 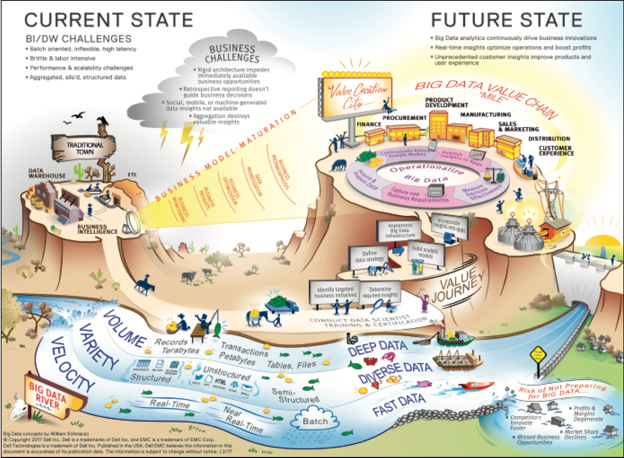 I originally published the Big Data Storymap on January 2013 as a way to creatively communicate the key factors to a successful Big Data initiative (see Figure 1). The only major change I would make to it today would be to change the rivers (which was meant to represent the deep volume and wide variety and high-velocity of big data) into a data lake. Landmark #1: Explosive Market Dynamics. Market dynamics are changing due to big data. Data, like water, is powerful. Massive volumes of structured and unstructured data, wide variety of internal and external data, and high-velocity data can power organizational change and business innovation. Ensure that your #BigData journey doesn’t end up in a data swamp of questionable economic value. Landmark #2: Business And IT Challenges. Big Data enables business transformation, moving from a “rearview mirror” view of the business using a subset of the data in batch to monitor business performance, to the predictive enterprise that leverages all available data in real-time to optimize business performance. However, organizations face significant challenges in leveraging big data to transform their businesses. Landmark #3: Big Data Business Transformation. Where are an organization’s aspirations with respect to leveraging big data analytics to power their value creation processes? Some organizations struggle to understand the business potential of big data. They are unclear as to the different stages of business maturity. Our Big Data Maturity model benchmarks an organization’s big data business aspirations, and provides a way to identify the level of sophistication desired for data monetization opportunities. Landmark #4: Big Data Journey. The big data journey requires collaboration between business and IT stakeholders to identify the right business opportunities and necessary big data architectures. The big data journey needs to 1) focus on powering an organization’s key business initiative while 2) ensuring that the big data business opportunities can be implemented by IT. Landmark #5: Operationalize Big Data. Successful organizations define a process to continuously uncover and publish new insights about the business. Organizations need a well-defined process to tease out and integrate analytic insights back into the operational systems. The process should clearly define roles and responsibilities between business users, the BI/DW team, and data scientists to operationalize big data. Landmark #6: Value Creation City. Big data holds the potential to transform or rewire your value creation processes to create competitive differentiation. Organizations need a big data strategy that links their aspirations to the organization’s key business initiatives. Envisioning workshops and analytic labs identify where and how big data can power the organization’s value creation processes. See the blog “The Big Data Storymap” for more details of the Big Data Storymap landmarks. While the Big Data Storymap has recently gained lots of attention, it’s getting old and blasé. It needs to be freshened up. So with a nudge from my friend Frederick Lardaro (on twitter as @FLardaro), I have created the “Big Data Game Board™”! So move aside “Monopoly,” “Risk,” and “Snail Race!” Time to teach the youth of the world of an important, career-advancing game: how to leverage data and analytics to change your life! Introducing the “Big Data Game Board™”! 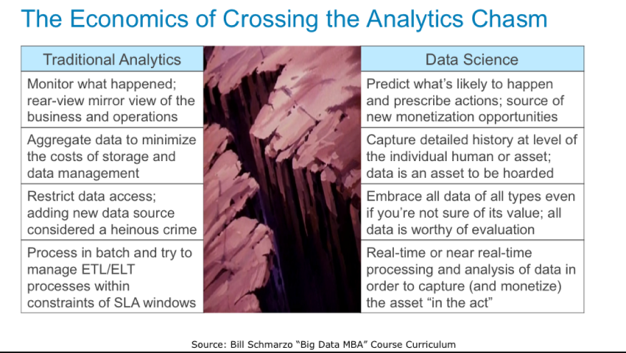 Trap #1: Did you get “Caught In the Analytics Chasm” or were you successful in “Exploiting the Economic Value of Data”? Many companies get caught in the “analytics chasm.” They don’t understand how to exploit the “economics of big data” to transition from descriptive, retrospective reports and dashboards, to predictive analytic insights and prescriptive actions. This chasm is preventing organizations from fully exploiting the potential of data and analytics to power the organization’s business models (see Figure 3). See the “Crossing the Big Data / Data Science Analytics Chasm” blog for more details. Trap #2: Did you “Fall Into The Data Swamp” or are you creating a “Collaborative Value Creation Platform”? Move away from Data Lake 2.0, where data is randomly stored for yet-to-be determined purposes, and instead develop Data Lake 3.0 that becomes the ultimate repository for the organization’s key digital assets – data and analytics. 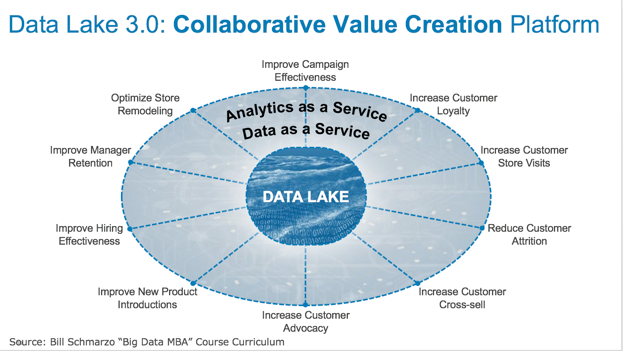 Data Lake 3.0 becomes the organization’s collaborative value creation platform, facilitating the collaboration between the business constituents and the data science team to leverage data and analytics to uncover new sources of customer, product, service, channel and operational value (see Figure 4). See the blog “Data Monetization? Cue the Chief Data Monetization Officer” for more details on Data Lake 3.0, the Collaborative Value Creation Platform. Trap #3: Are you pursuing “Technology Tail-chase Trail” or are you “Focused on Business Outcomes”? 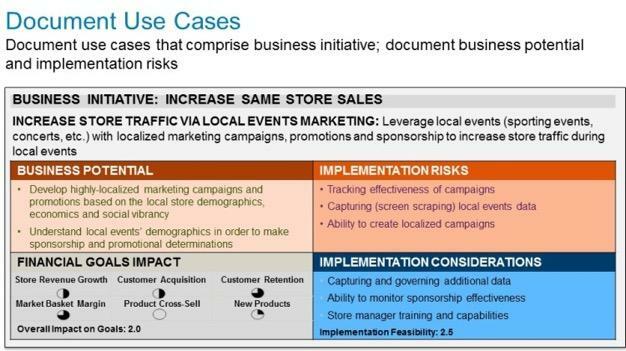 Organizations don’t fail at Big Data because of a lack of use cases; they fail because they have too many. Organizations need a formal, collaborative process to identify, validate, vet, value and prioritize the use cases, and ensure IT and Business alignment in pursuing those use cases with the optimal mix of high business value and high implementation feasibility (think “low hanging fruit”). Invest the time upfront of a Big Data and Data Science initiative to understand in details the financial, customer and operational drivers that constitute a use case, and flag any potential inhibitors and implementation risks. Come into this game with eyes wide open (see Figure 5)! See the blog “Use Case Identification, Validation and Prioritization” for a process to guide the identification, validation, valuation and prioritization of the organization’s business and operational use cases. Trap #4: Are you “Floating Away with Over-inflated Promises” or taking a “Pragmatic Value Engineering” approach? Over-hyped technology innovations provide the ultimate “Field of Dreams” moment with non-scientists cranking away on science experiments. While there is value in organizations getting familiar with new technologies, the technology Proofs of Concepts should NOT be inflicted upon business stakeholders with over-fabricated expectations of grandeur. 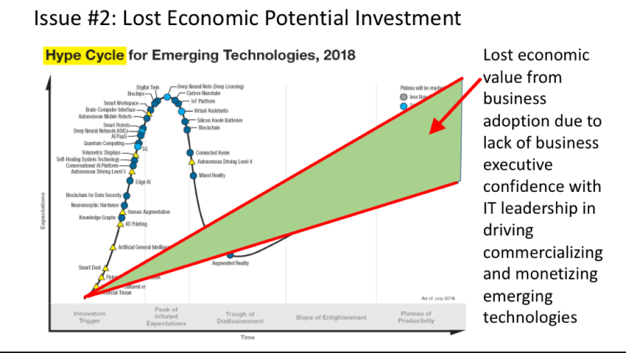 Business users long ago stopped believing in the technology “Silver Bullet” solution – a simple and seemingly magical solution to a complicated problem (see Figure 6). See the blog “Why Accept the Hype? Time to Transform How We Approach Emerging Technology” for more details. Trap #5: Have you perished on the “Plain of CLM: Career Limiting Moves” or did you scale the mountain of “Envisioning to Build Business Support”? One key challenge to a successful Big Data journey is gaining consensus and alignment between the business and IT stakeholders in identifying the initial big data business use cases that 1) deliver sufficient value to the business, while 2) possessing a high probability of success. One can find multiple business use cases where big data and advanced analytics can deliver compelling business value; and it is critical to big data and data science adoption that the business stakeholders have had a chance to voice their opinions and to help proactively set the big data and data science agenda. 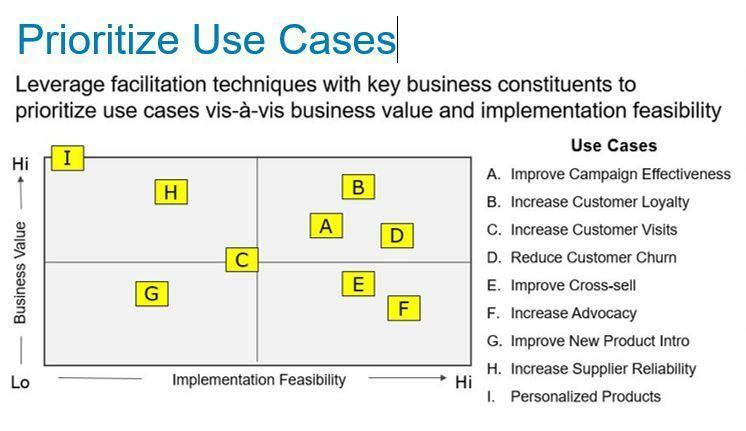 We have found one tool for driving business and IT collaboration and agreement around the “right” initial use cases for your big data and data science journey – the Prioritization Matrix (see Figure X). See the blog “Prioritization Matrix: Aligning Business and IT On The Big Data Journey” for the mechanics on how to use the prioritization matrix to drive organizational alignment.